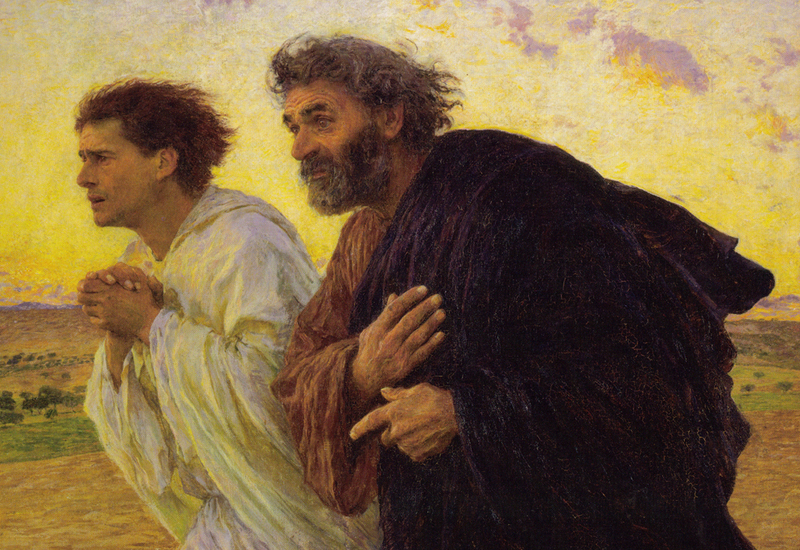 My favorite painting in the world – Eugene Burnand’s Saints Peter and John running to the tomb – their faces filled with hope, disbelief, incredulity and perhaps something verging on joy! Has He risen as He said! Will we again be together! The first time I ever saw this I was overwhelmed with my own emotions because the John and Peter I met in this paining were as I had always imagined Jesus’two companions and Apostles! Today is Pasquetta, Little Easter in Italy, a big holiday throughout much of Europe. I am celebrating Easter for the first time in many years in the U.S., and it has been beautiful from the moment I got off the plane on Holy Saturday afternoon to this minute that I am preparing today’s column. The only difficult moments occurred when I had to try and ward off some jet lag at the always very lengthy and always extraordinarily Easter Vigil Mass! I attended this Mass at St. Matthew’s cathedral in Washington, with Cardinal Donald Wuerl presiding. Every person who had a role that evening did a superb job, from the ushers to the choir, from musicians to eucharistic ministers, from truly amazing lectors to beautifully talented cantors. I was just grateful that it was at the start of Mass that the church was darkened, lit only by hundreds of small candles, and not at the end of Mass! Easter Sunday was beautiful in every way – weather-wise and celebration-wise. My hostess Margaret Melady and I spent the afternoon with her daughter, son-in law and four teenage grandchildren. It was a joy – a terrific meal, lots of great conversation and for me, just being in a family was the best part of the day, enjoying a home and back yard and tons of flowers in bloom. I could have driven around DC for an hour just to take photos of the azaleas, cherry blossoms, wisteria, roses, magnolias, bouquets of crocuses and colorful daffodils that carpet the landscape. Some neighborhoods and individual homes were beyond breathtaking! Easter is obviously a family day, a day off from work for many of us so I waited until today to want to share a story with you that actually has yesterday’s timeline – April 16, 2017 – Easter Sunday and also the 90th birthday of our beloved Pope emeritus Benedict XVI. He was born on Holy Saturday and marked 90 years on Easter Sunday! Does it get any better! My paternal grandparents had two lovely summer homes on a large piece of property on Lake Michigan that were used alternately by my parents and my Dad’s sisters and brother throughout June, July and August every summer. The main home was called White Ledge and was a legend in the area for many reasons but mainly because it could accommodate about 30 guests on a weekend – many bedrooms and bathrooms and, of course, a huge dining room and kitchen. My grandmother spent six months a year at this home and hosted many philanthropic and church events in the house or gardens. One of my grandfather’s brothers – our great-Uncle Frank and great-Aunt Julia – had a rather large estate about a mile up the road from our property. Because the Catholic populace grew so much when people came up for the summer, the small local church could not handle everyone, even with multiple Sunday morning Masses (no evening Masses in those years), and so my aunt and uncle obtained permission to have Mass outdoors at their home on Sunday. They were great philanthropists and the Church was the focus of their lives. It was quite common for them to invite some of their closest friends – cardinals, bishops, priests and seminarians – to spend the weekend at their Michigan summer home. The main house was quite large and they a number of almost equally large year-round homes on the property for their large family and for guests. Every Saturday night, the caretaker Ignatz would set up the “pews” – the benches and kneelers – for a couple hundred people. And every Sunday morning, before the 10 a.m. Mass, big bunches of gladioli were cut and put into tall vases near the altar – which was at the top of some steps going up to my uncle’s main porch. My brothers and some of our young cousins often served as altar boys in those years. My Dad and uncles served as ushers and Sunday morning Mass at Aunt Julia’s and Uncle Frank’s was often a family affair! I do remember Aunt Julia telling us once, years later that, for 30 summers, it never rained on a Sunday morning between 10 a.m. and 11 a.m.! I know she had several relics she would bring out each Sunday and place on her pew. Over the years I met many prelates, as you can imagine. I just wish I had thought then of keeping a diary! One of the priests I remember seeing when I was fairly small was Fr. Toohey. I remember him as being a delightful man who always wore a big smile and was very grandfatherly. Years later, when I arrived home on vacation, I noticed a beautiful chalice in my parents’ home and asked the about it. Dad told me that his parents, my grandparents, had paid for a young man – Fr. Toohey – to attend seminary on Chicago and on his ordination day, gave him this chalice. Yes, he was ordained on April 16, 1927! The very day Pope Benedict was born! It is a little hard to see in this photo of the bottom of the chalice. And, of all the truly amazing things, the chalice was made in Germany! I have been told – and have to explore this further! – that these markings indicate exactly where in Germany this was made and by whom. The chalice was purchased at Edward Koenig Company in Chicago. It was given to my grandfather when Fr. Toohey died at 53 on January 8, 1950, then passed to my Dad, and my parents eventually wanted me to have this chalice. I’ve had several dreams for this chalice. I hope to set up a scholarship for a seminarian from Chicago at the Pontifical North American College in Rome and will arrange to have this chalice given to a seminarian from Chicago – so that, after many decades, the chalice makes a “round trip,” returning from whence it came. My biggest dream was to have Pope emeritus Benedict XVI celebrate Mass with this chalice. Since I wrote this story for the first time a few years ago, that dream has come true. At 7:30 a.m. on the morning of October 19, 2013, I attended Mass in the chapel of the monastery where Pope emeritus Benedict XVI lives in retirement with Abp. Georg Gaenswein and four memores or consecrated women. Benedict XVI said Mass with Fr. Toohey’s chalice, Abp. Gaenswein did the readings. It was beautiful and intimate and very moving for me, a morning that was special beyond telling! The Pope emeritus came from the sacristy after Mass and we spoke for about five or six minutes – it was as moving and wonderful as the Mass itself! I had written the story down in English and had given it one day to my friend Michael Hesemann who knew I had hopes that Benedict would celebrate Mass with the chalice. He translated it into German and, during a trip to Regensburg, Germany, gave it to his friend, Msgr. Georg Ratzinger, the Pope’s brother who, two weeks later, gave it to Pope emeritus Benedict. I received a phone call, telling me that Pope emeritus Benedict would be delighted to say Mass with this chalice – would I like to be present?! Following Mass and our brief but ever so memorable conversation, Pope Em. Benedict gave me a rosary and two holy cards for the young man who will receive this chalice some day and he gave me – for myself – a rosary and two holy cards. Abp. Gaenswein handed me an envelope and inside was a note with his crest that stated that Pope Em. Benedict said Mass with this chalice on October 19, 2013. I have yet to write the final line to this story – the name of the seminarian to whom the chalice will go. P.S. Three hours later I met Pope Francis at a gathering of the Patrons of the Vatican Museums! The singular, joyful, unforgettable Day of two Popes! Monday morning, April 16, 2012, in the Pauline Chapel, in the presence of members of the College of Cardinals and bishops from his native Bavaria, Pope Benedict celebrated a Mass of thanksgiving to mark his 85th birthday that day and the April 19th anniversary of his election to the papacy. In his homily he recalled how, on the day he was born and baptized, the liturgy “erected three signposts showing me where the road led and helping me find it”: the feast of St. Bernardette of Lourdes, the feast of St. Benedict Joseph Labre, and Easter Saturday which fell on the very day he was born. He spoke at length of the two saints, and then focused on Holy Saturday. HAPPY EASTER OF THE RESURRECTION! And their hands – hands that are filled with hope as well. When I saw this painting for the first time, I felt I knew these Apostles. I was looking at the images of St. Peter and St. John that my mind’s eye had created a long time ago, as child. Will we look like this someday as we await the Resurrection?! My favorite painting ever! This is how I have always pictured Peter and John! The wonderment, the awe, the trepidation, hoping to see their friend, their teacher, their Rabbi once again but wondering, in a human fashion, how He could rise from the dead! “The Disciples Peter and John running to the sepulchre on the morning of the Resurrection”- by Eugène Burnand, found at the Musée D’Orsay in Paris.